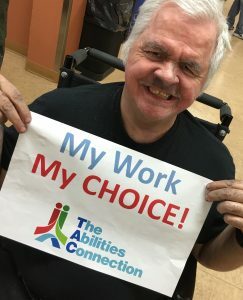 This is what thousands of individuals with disabilities and their families are proclaiming on the first National Day for Choice today. The day’s campaign will help to ensure they have the right to choose where they want to work, live and engage in the community and not where government directs them. CEO Mary Brandstetter along with employees with disabilities shown in this photo like working and want TAC to continue to be an option for them. They earn a paycheck, see their friends, and enjoy the satisfaction of a job well done every day. TAC fully supports their decision for CHOICE in all aspects of their lives and supports this campaign. The National Day for Choice is the idea of The A-Team national grassroots movement. 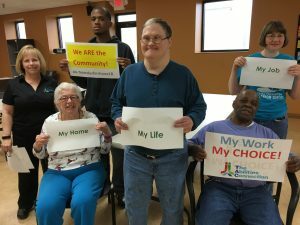 This movement unites persons with disabilities and their families to advocate in a grassroots effort, create awareness in the community, and advise others to ensure a full array of service choices. The movement is steadily growing across the country as people become more fearful and discouraged with federal and state government agency efforts to limit important work and home choices, such as pre-vocational training centers, through imposing laws, overreaching rules and regulations.